Who is it for? 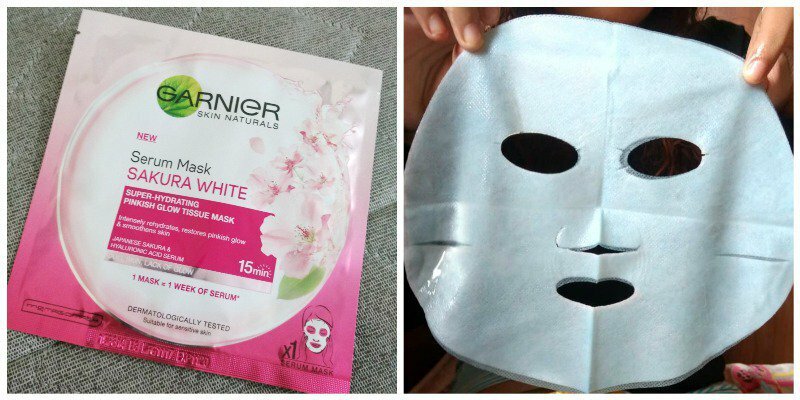 Garnier Serum Sakura White Mask is for those looking for an affordable brightening sheet mask. Step 1: unfold the mask. Apply on clean face with the blue protective film facing outwards. Step 2: remove the protective film. Adjust the mask contours on your face. Step 3: leave it for 15 minutes. Step 4: remove the mask. Gently massage in any excess serum or use a cotton pad to remove. Dermatologically tested and it is also suitable for sensitive skin but keep away from eyes. The fragrance is quite strong when u first put the mask on but gradually your nose gets used to it. Sensitive nose people will not like the fact. The serum contains in the mask is transparent and the mask comes with a blue protective film that is to be removed after applying. The product is for the dull skin with lack of glow the mask will restore the pinkish glow and smoothen skin. Our skin becomes dull with the everyday work and pollution so this sheet mask actually brightens and lifts the skin. I personally could not see pinkish glow after one use but definably it brightened my face for a while but the glow faded afterward. After using the mask your face might feel grassy so you may have to remove the excess serum or wash your face, unlike another sheet mask. Yes definitely. On first use, it definitely brightened my skin and I want to use this mask once a week to see if it actually reveals the pinkish glow or not. For budge5t friendly sheet mask, one can really go for it. So it’s just an average face mask like basic Korean sheet masks..
it worked beautifully for me. provided me with much needed hydration to my oily skin. and the wffwcts were long lasting too.